With it being Sunday you think it'd be time to ride the gospel train again, but I've got deeper funkier places to take you. The slow seedy funk of Cardell's Funk Machine seems fitting. This is raunchy drop top 80's funk, is perfect for cruising. The beat is mellow and the mood is pimperific. Fantastic analog dripping synthesisers over slapped up bass lines. It's sloppy, atmospheric, and down right rude. I don't think I've heard a stripped down bass and drum track sound so nasty. This was another one I wanted to share for the anniversary party. There's some bacon gettin' cooked up around the beginning of the song. It's not mint, a bit scratchy really, but because it's so majorly rare I think its ok. 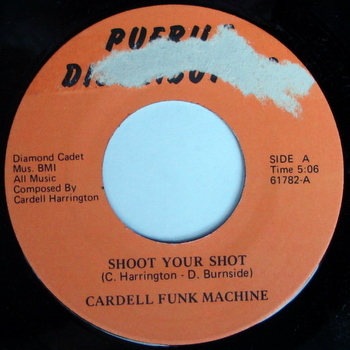 I've heard that even Mr. Cardell doesn't have a copy. However, I know he's struck a deal with PPU and made a little cash from this slice of funk. I know the folks at PPU take care of thier folks and have honest business practices, something I think needs commending. I think many artists are getting more these days then when these tunes first came out. I know I bought my first copy of this on the PPU label, and maybe that's a way to ensure they get a piece of the action. I'm struggling with figuring out a way some of the artists that get exposure on this blog can make a dime or two. I'll figure it out, but I wouldn't want to scare people away with a fee. For now, we'll just stick to spreading the good word on artists that need exposure, and sharing a few offerings in hopes that consumers will hunt down and/or buy what IS available. We'll come up with something for the site though.... For now, we'll just continue to pay tribute instead of paying fees.